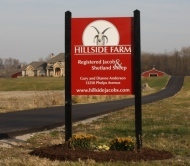 Welcome to Hillside Farm, home of Hillside Jacob Sheep. Visit us via these photos, which reflect our farm in different seasons. Two former Californians made a new friend during their first Michigan winter. April wildflowers growing in ram pen, a sign that Spring finally is here. 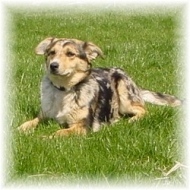 Dixie, our farm dog and the best kind of dog in the world.....a free dog. Shearing Day 2009: Dianne working on the new skirting table. Springtime at Hillside Farm: locust trees are in bloom. 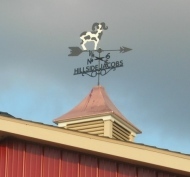 Jacob weathervane on each of our two barns. New barn resulting from not having built the original new barn large enough. Postcard-worthy photo taken during fall 2009's first snow storm. Hillside Farm sign installed November 2010.